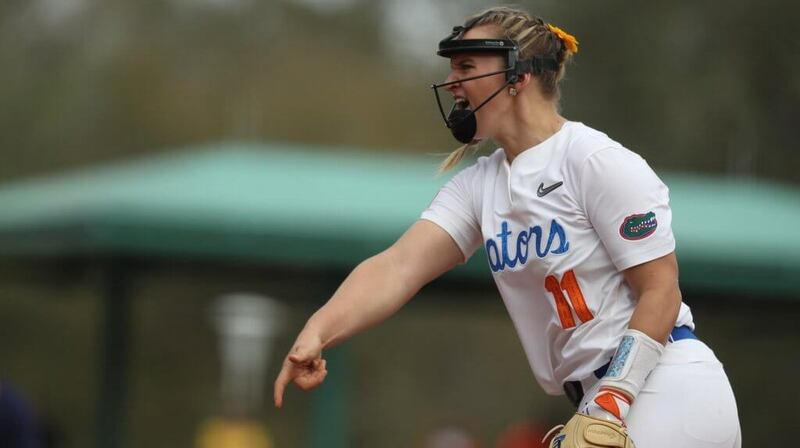 After a big opening weekend, there were the usual surprises, disappointments and impressive performances in the Division I ranks which led to some shuffling from the preseason rankings in the Extra Inning Softball/JWOS College Power Rankings. Here’s our Week 1 rankings as compiled by our college correspondent Justin McLeod, publisher of Justin’s World of Softball (JWOS). The defending national champions began the season with a perfect start, and recorded four shutout wins, two by run-rule. Outscoring their opponents 39-5 through the course of the week, the Bruins recorded a pair of run-rule wins in their own right. Playing three now-ranked teams, the Gators shutout Michigan and recorded wins over North Carolina State, Arizona, and South Florida. With a tip of the cap to the Sooners’ pitching staff, which gave up just two runs in five games, the squad outscored their opponents 44-2. A pair of double-digit wins over perennial NCAA tournament team Illinois-Chicago highlighted the Lady Vols’ opener, which also included a victory over Boston. The highest-ranked team with a loss, the Huskies endured a controversial defeat at the hands of Notre Dame in Puerto Vallarta, but recorded wins over Baylor and Liberty. An impressive offensive output and effective pitching that included a no-hitter, the Tigers quieted some doubters on both sides of the ball. Three run-rule victories highlighted the Tide’s opening weekend, though a 16-10 win over Murray State raised some questions about the team’s pitching staff. The Longhorns lived up to expectations in week one, outscoring opponents 32-3 with three run-rule wins. Losses to Florida and an upstart North Carolina State team saw the Wildcats end opening week with a surprising, near-.500 record. An upset loss to Indiana ended the Bulldogs’ weekend on a low note, but wins over Florida Atlantic and Virginia highlighted the opening slate. After an offensive onslaught against smaller-market teams, a pair of victories over Cal on Monday gave the Cajuns two early resume-boosters. Victories over McNeese and Lipscomb highlighted the Hogs’ opener, while the team’s pitching staff allowed just four runs through the course of the five games. The Cowgirls began their season with a loss to Illinois, but rebounded to beat Houston; Kentucky; and the Illini in a rematch and swiftly get on the plus side of the new season. It was mid-March before the Hoosiers reached five wins a year ago, and not only did they reach the number far earlier, they did so in convincing fashion that included a win over nationally-ranked Georgia. Perhaps the biggest jumpstart team of the week-old 2019 season, the Wolfpack’s record is somewhat deceiving - their losses came on a bottom-7th sacrifice fly to Florida and by one run to Michigan, and they earned wins over Arizona and South Florida. A one-run loss to BYU and a solid defeat at the hands of Washington marred the Bears' time in Puerto Vallarta, where they did earn victories over South Carolina; Liberty; and North Carolina, the latter in extra innings. A run-rule, resounding defeat at the hands of Missouri was a large stain on the Sun Devils' opening weekend were their biggest wins against Kansas and in a 20-run differential against Weber State. The Wolverines' season-opening win over North Carolina State looks better all the time; they also bested South Florida in convincing fashion, while suffering defeats to Arizona and Florida. After a tumultuous offseason, the Ducks recorded a perfect record on opening week, quieting a lot of doubters. Small-market wins, yes, except a victory over Missouri, but exactly what the doctor ordered for the team and fanbase in Eugene. The Gamecocks' loss to Baylor was not horribly surprising; a shutout loss at the hands of North Carolina was rather extraordinarily so. The squad did record wins over Notre Dame (by 3) and BYU and Duke (by one run each). Kicking off their season this coming weekend, the Dukes will face a pair of ranked teams in Oregon and Tennessee, as well as Kentucky; Cal; and Florida Atlantic. A surprising 1-0 loss to Stephen F. Austin closed out the Bulldogs' hosted opening tournament that also included wins over Middle Tennessee and SFA, as well as a perfect game from pitcher Alyssa Loza. An upset win over Auburn and a perfect showing to start the year helped the Bulldogs nab a spot in our rankings. A 4-1 showing on the weekend looks good in the win-loss column, but a crushing 10-2 defeat at the hands of North Texas via the run-rule was not a good look for Jo Evans’ squad.